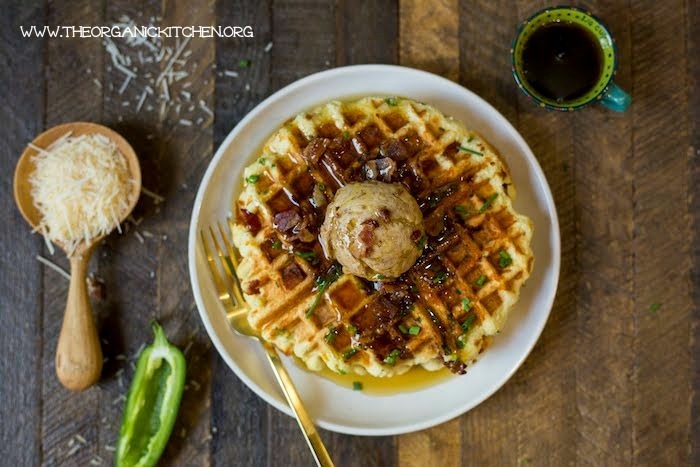 Prepare for flavor like you have never experienced in a waffle before, because these Parmesan Chive Jalapeño Waffles with Maple Cinnamon Butter are going to blow your mind! 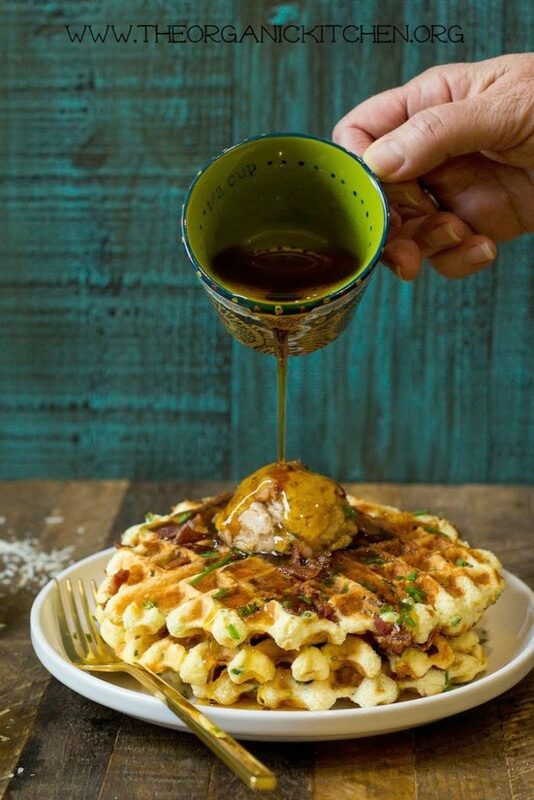 To make these waffles I add savory Parmesan cheese, flavorful chives, a touch of spicy jalapeno, and salty bacon to my favorite waffle batter and then top with naturally sweet maple cinnamon butter! Honestly the combination is downright heavenly! Traditional, Gluten Free and Paleo Options! My theory on mixes…if they taste just as good as waffles made from scratch and have no questionable ingredients, I say why not make life easier? 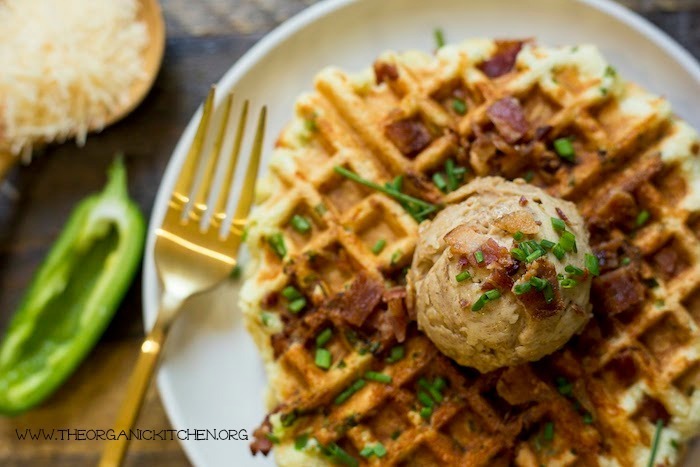 For the Paleo version of these waffles I use Birch Benders Paleo Waffle Mix, they are amazing and cook up crispy! 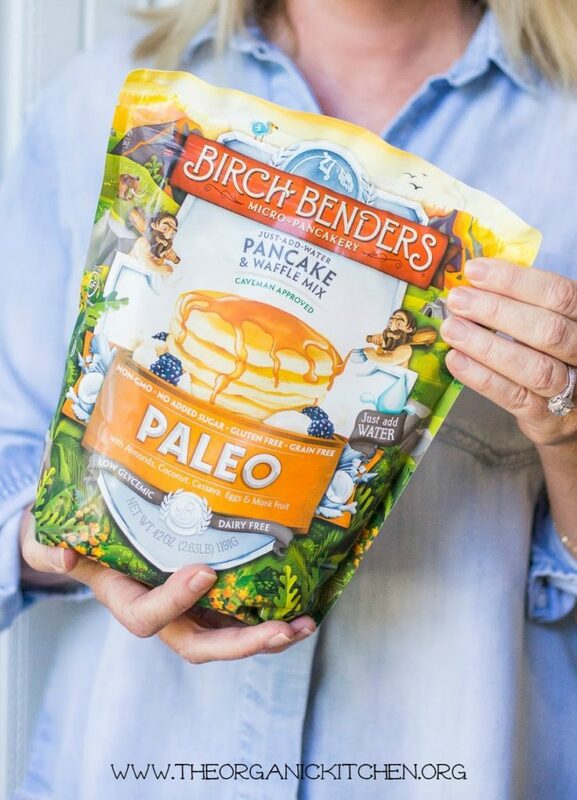 Birch Benders also make an Organic Gluten Free Waffle Mix. For those of you that want a traditional waffle mix, I recommend Kodiak Cakes, Of course you can always use your favorite waffle recipe and just follow the directions below to flavor it up. Whichever you choose, it’s going to be unbelievably good! The Magic of Maple Cinnamon Butter! As if the waffle itself weren’t delicious enough I top it with a maple cinnamon butter using butter from grass fed cows. If you are getting nervous about all this flavor, I get it. But trust me…all I ask for is a little trust! You are going to love it! Put It All Together and…. …holy moly! 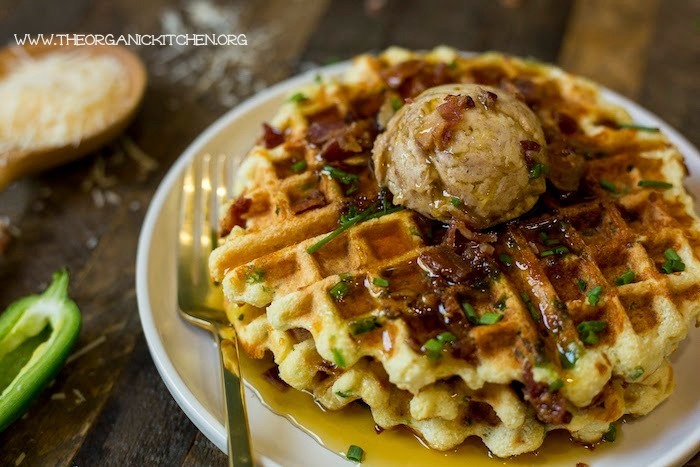 It’s a flavor sensation and the best savory waffles I’ve ever tasted. If you aren’t sure how to handle that jalapeño, click for a tutorial! 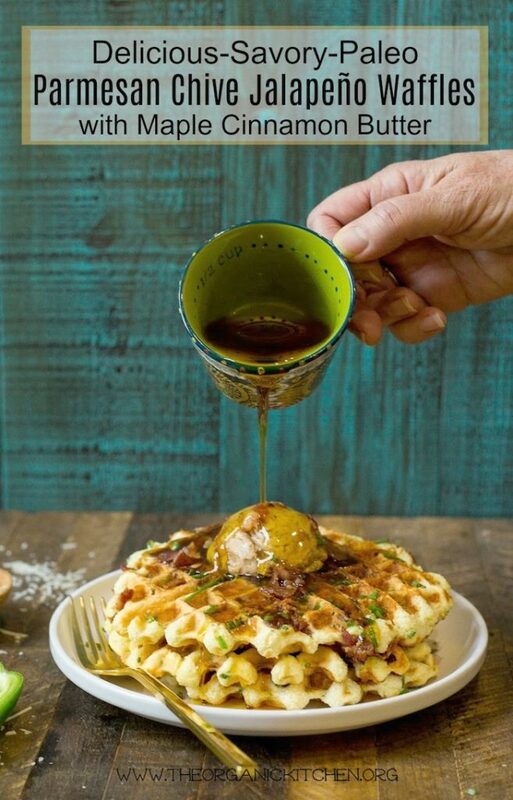 A savory, sweet and spicy waffle that will blow your mind. Can be made the traditional way or gluten free/Paleo! Prepare 2 cups waffle mix according to package instructions then add the peppers, bacon (reserving 2 Tablespoons for garnish), cheese, and chives, mixing well. Top with maple cinnamon butter, sprinkle with reserved bacon, and drizzle with maple syrup! 10 Incredible Whole 30 Steak Dinner Recipes!